Today, I'm thinking (as are many of you) of our fallen heroes and their families. I'm grateful for their bravery and their sacrifice. My heart goes out to those who will be visiting their loved ones not at a party/bbq/picnic, but at a cemetery. Today's post is dedicated to those who laid down their lives. Thank you. You are not forgotten. Today is also a great time to check in with our friends at Operation Write Home. It's been a while since I've participated in a OWH sketch challenge, so what better time than today?! The sketch gave me the perfect opportunity to play with some Stampin' Up! sneak peek items from the upcoming new Annual Catalog (debuts June 2). I've incorporated two of the yummy new In Colors, Hello Honey and Lost Lagoon along with a terrific new paper collection. The Moonlight Designer Series Paper Stack features 48 sheets of patterned paper in a 4-1/2" x 6-1/2" pad. 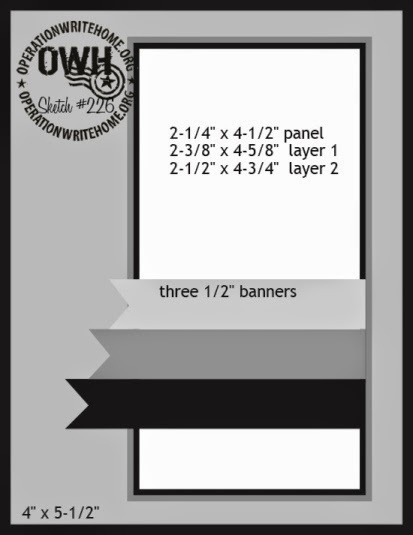 There are multiples of each design - 4 each of 12 double-sided designs - great for creating multiples of cards for OWH. The greeting card sentiment is from the Starburst Sayings stamp set and is a breeze to cut with the coordinating Starburst Framelits. If you love stamps with coordinating framelits, be sure to check out the Starburst Bundle (available with wood-mount or clear-mount stamps) before June 4 when the 15% off bundle offer ends. Finally, to give my card a lil' somethin, somethin, I embossed the Lost Lagoon cardstock panel using the Honeycomb Embossing Folder which tied in perfectly with one of the paper patterns. As you can see, I flipped the sketch and created a mirror image, but kept everything else more or less the same. It's a great basic sketch with lots of possibilities. *Bundle: Starburst Sayings Stamp Set + Starburst Framelits (Wood-Mount Bundle 134817, Clear-Mount Bundle 134818) Save 15% with the discounted bundle - available through June 4, 2014. Great card! Love the yummy color combos! Super design flip, see,s more balanced your way! Thank you, Cheryl. The design can easily go either way, but I like the flip too! Love the way you switched it up...great colors and papers. Very nice. Thanks much, Debbie. Lots of versatile papers in this paper stack - great for masculine or gender neutral. Gayle, this card came out beautiful. I wasn't sure I liked these colors until I've seen them here in your card. Nice DSP also. Enjoy your day. Thank you so much, Donna. 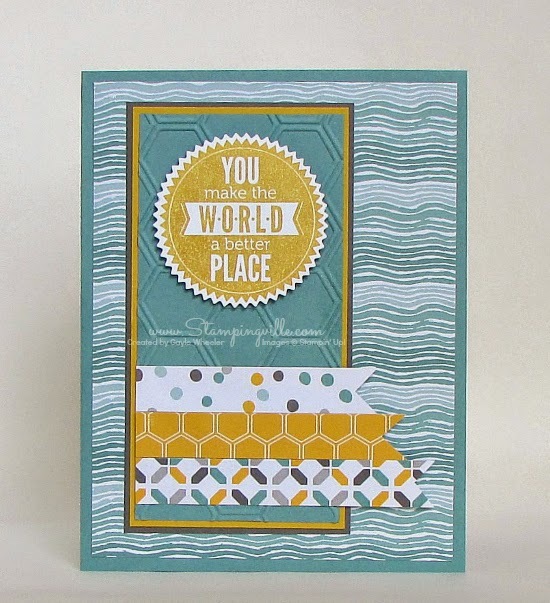 I chose the DSP first and then chose the coordinating cardstock colors. Sometimes this method helps us "warm up" to colors we aren't sure of just yet! 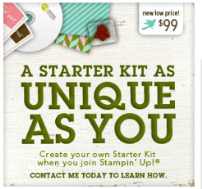 Project Life by Stampin' Up! is Here!